This chapter was quite beefy, so it will take a few installments to adequately cover the material. In chapter two, Bird seeks to unravel the riddle of righteousness. Scholars have devoted massive amounts of energy towards discovering what righteousness means in Paul's letters, yet are far from reaching a consensus. Moreover, where scholars end up on this issue tends to determine the overall shape of their theology. For example, N.T. Wright understands the righteousness of God as his covenant faithfulness. Anyone who has spent time with Wright realizes how important this concept is to his thinking. John Piper sees the righteousness of God as God's unwaivering commitment to his glory, and this conception undergirds his vision for the Christian life (i.e. Christian Hedonism). 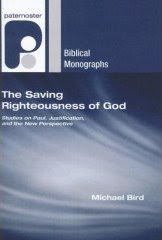 The topic is thus of central importance, and if agreement can be had on the meaning of righteousness, many debates in Pauline studies can (ostensibly) be resolved. (i.e. counting/crediting) Christ's righteousness to them, while Catholics hold that God makes people righteousness by imparting to them a real righteousness. In the last 10 years, there have been attempts by Catholics and Protestants to reach an agreement on this issue. However, I agree with Bird that indissoluable differences remain between the positions. Bird goes on to state that there is not a huge difference between imputed and imparted righteousness, as long as we are clear that a status is being talked about. I applaud his desire for rapprochement, but I think his point might muddy the ecumenical waters. I don't want to give Catholics the impression that there is more agreement between our positions than their actually is. Further, if righteousness is a status that God imparts to believers, doesn't that entail their actual perfection? If it doesn't, then how precisely is it different than the Catholic position? Second, Bird addresses whether righteousness pertains to a right relationship, or adherence to a norm. The Hebrew concept of righteousness appears to relate to the rightness of actions in relation to persons and social relationships (10). The Greek concept of righteousness denotes adherence to a norm. Bird rightfully demonstrates that it is wrong to foist a dichotomy here, since God's covenant with his people establishes the norm by which actions are weighed. Therefore, when we speak of people or God acting righteously, the norm for righteousness is provided by the covenant relationship. I think there are times when God's righteousness doesn't have as much to do with the covenant (such as when he acts righteously towards the created order), but I agree with Bird's point. Also, I remain confused why some scholars (e.g. Seidfrid) are so adamant in trying to disassociate the concepts of righteousness and covenant. All right, that's all for now. Dr. Bird, I'm interested in (1) why some people are so unwilling to associate righteousness and covenant, and (2) if you think that justification has a universal scope. As I read Stuhlmacher, he seems to have this idea that God will justify the cosmos (i.e. new creation). Do you buy that usage of justification, or do you think it is strictly anthropological? (1) I have to ask first, what would Paul make of the imputed vs. imparted righteousness debate. Part of me wonders if he would even understand it. Moreover, false unities are misleading and harmful, but so ar false disunities. Some Catholics like J. Fitzmyer have very Protestant understandings of justification (go ask D.A. Carson on that one). (2)Why do some see a link between righteousness and covenant faitfulness. A few reasons. First, covenant is a big theme in the OT so it is unsuprising if it would intersect with God's righteousness. Second, a number places in the OT seem to link God's righteousness with his faithfulness (do a word search) and faithfulness here must connote its connection to the covenant relationship with Israel. (3) Strictly speaking Paul does not use the dikai- word group to describe what God does to or with the cosmos. But there clearly is an element of God one day rectifying or transforming the world which is bound up with his creative-saving activity. (1) Yes, I'm not sure what Paul would have made of the imputed v. imparted righteousness debate. My point is that the terms carry a lot of historical and systematic theological baggage, and that cautions me against seeing little distinction between them. Maybe some new terminology is needed (perhaps that's where your proposal for an incorporated righteousness comes in). I'm all for knocking down false disunities, and Fitzmyer clearly has a huge part to play in this. (2) I concur that covenant and righteousness are closely correlated. What I'm wondering is why some within the guild are opposed to acknowledging the correlation. Covenant is such a massive biblical concept, and it's difficult for me to envisage a scenario where righteousness has very little to do with it. (3) That helps. Your stuff on the relationship between righteousness and justification cleared up some of these issues for me.